What is magic? The Anthropologist Bronislaw Malinowski wrote that magic involves the use of paranormal methods to manipulate natural forces to accomplish important life goals. Malinowski discussed how the Trobriand Islanders used magic to manage anxieties of necessary yet dangerous deep sea fishing. According to most scholars, magic is a self-direct activity where an individual manipulates the supernatural to shape the natural. This approach sees magic as an individual practice. However, what if magic is communal? What if magic is something that people create together when they gather for special circumstances and become changed in the process? This is what happened on Saturday night at Blind Bob’s Bar when Cricketbows played a magical set of truly transformational psychedelic rock and roll. It has been said that a Cricketbows show is a religious experience. And we would not disagree with that but would offer another perspective, perhaps a Cricketbows experience is a magical experience as well. From the very moment the band took the stage, the crowd could sense an otherworldly musical magic taking hold of them. The band began their set with some of the fantastic songs from their most recent record, ‘Communion’ — a rather apt metaphor for what was happening between the band and the audience that night. 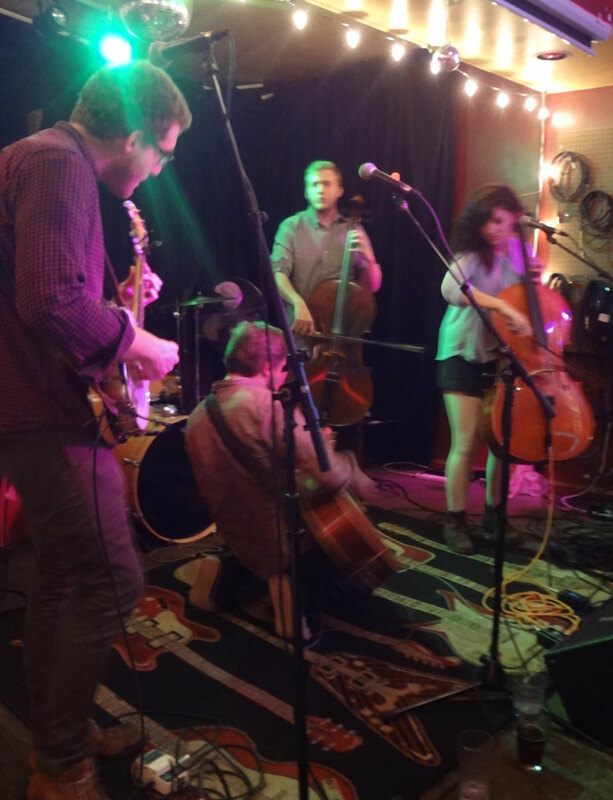 Throughout the set, Cricketbows demonstrated not only excellent song craft but powerful delivery that seemed beyond the usual experience of the concert goers. The band moved through songs from ‘Communion‘ playing the excellent ‘Games People Play’, the moving ‘End of the Night’, and the psychedelic ‘Sea Green’ to new songs that they are recording or soon to record. They also played a fine selection of tunes from their stellar full length ‘Diamonds‘ featuring standouts such as ‘Tiny Little Houses’ and ‘Landing on the Moon’ to more than enthusiastic response. The audience was transfixed — as with all good magic where the individual loses their sense of separated self and becomes part of the group, collective experience — the audience repeatedly called out for more and the band happily obliged with the cover of the Porpoise Song with a burning intensity that led to cheering and clapping for several minutes until Chad Wells profusely thanked the crowd and had to ignore the calls for more songs from the crowd as the house music came up because the bar was closing soon. The musicianship throughout the evening was incredible. Christopher Corn on bass was giving a master class in how the bass guitar could not only support a song but could be used as a main instrument in service to a song. The twin guitar attack of Michael Bisig and Chad Wells was amazing. Both are stellar musicians separately however together they transform a song into something powerful with their guitar styles. Kyle Sweney on drums and percussion was incredible through his efforts at propelling a song like an illusion of a runaway freight train yet in reality always in control. As a concert goer, what is it that you want from singers? Skill? Power? Vocal artistry? Something intangible that cannot be easily grasped? Aarika Watson is a vocalist with few peers. Her singing is more than mere melody. Her screams, yelps, and shouts are more than mere power. She has a rare vocal talent that pulls in the listener as if you believe that she is singing directly to you and only you in that moment in that song. It is difficult to describe the feeling if you have not seen her sing. Dare one say, it is magical. And Chad Wells, the leader of this spiritual journey, sings with the passion and precision that escapes many singers. His voice is energy. He bends the notes with a fervor of a mission to save souls and convert the listener to a musical salvation. Chad feels the song in a way that will send chills down your spine. And when Aarika and Chad sing together, weaving their voices in a tapestry of the honest human voice such as with ‘Landing on the Moon’ or ‘Sea Green’, nothing else matters. The listener is not thinking about what to do tomorrow, you are there in that moment hearing those sounds, those voices and you are transported, you are indeed changed. Isn’t that what magic is supposed to do? To create a transcendence through community in a moment that becomes something special. That is Cricketbows. Recorded on May 5, 2017 at Oddbody’s Music Room! Mack was playing withShooter Jennings that night. You can listen to more of Mack’s muisc on reverbnation! Mack has a show on February 3, 2018 with Justin Wells! 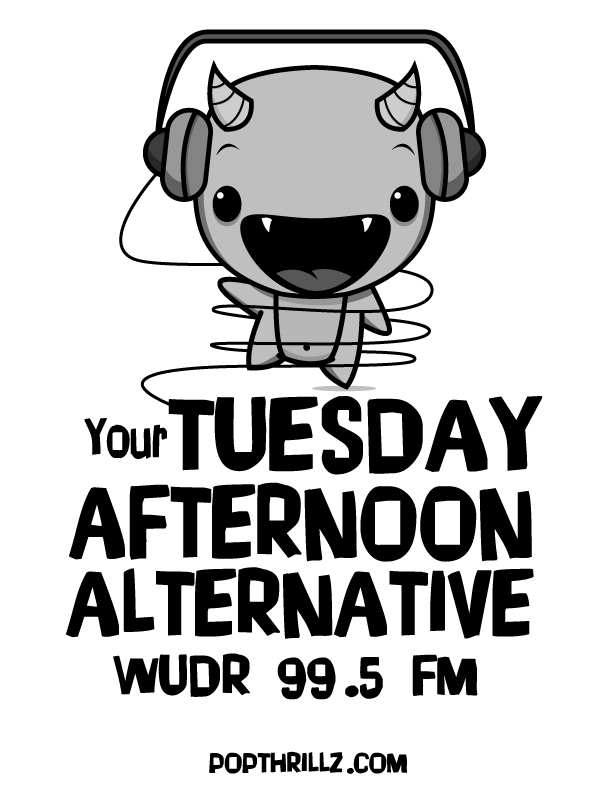 Fine fellow and great musician Tod Weidner joins Your Tuesday Afternoon Alternative this week as we celebrate 10 years of the show. 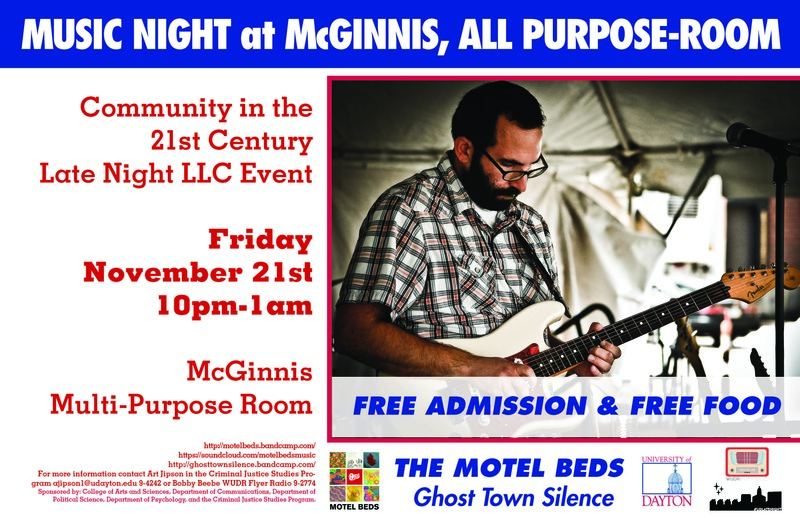 Tod plays in some mighty special Dayton bands – SHRUG and The Motel Beds! 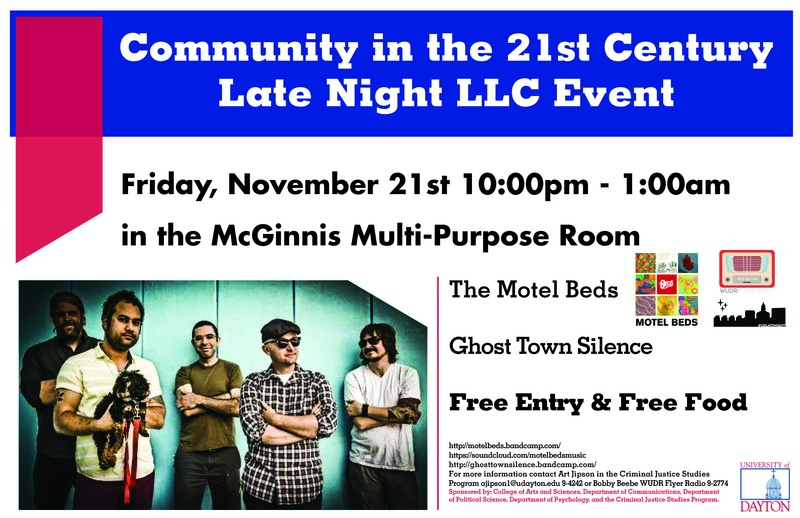 The ‘Beds will play our tenth anniversary show this Friday with Ghost Town Silence! You can expect music from all of those bands as well as an assortment of new tunes and music that spans the anniversary of the show! Ten years gives us quite a bit to fall back on for the set list but you can always suggest songs and bands by connecting with us on twitter or gmail at drjwudr. And, hey remember those old analog ways of making connections? Sure, us too. Give us a call during the show at 937-229-2774 – we would love to hear from you. 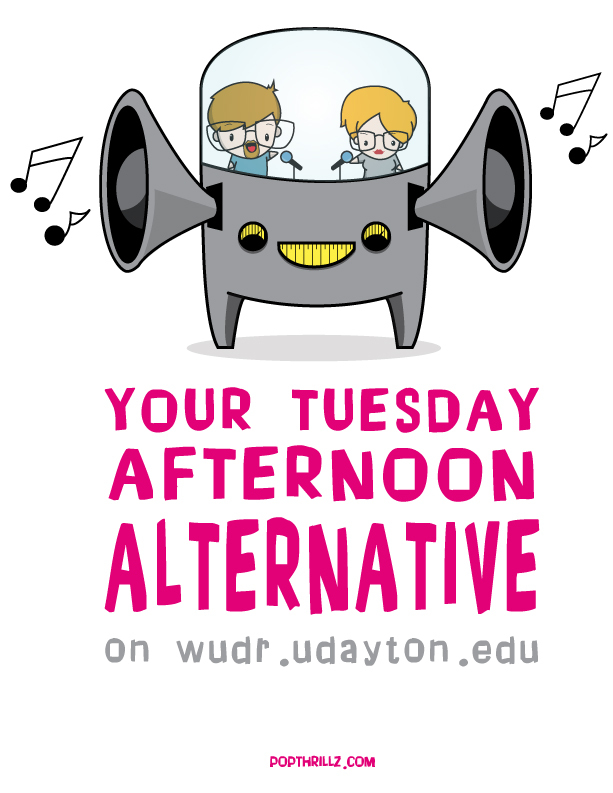 So, join us Tuesday, November 18 from 3-6pm on WUDR and then come to the anniversary concert on Friday from 10pm -1am at the McGinnis MultiPurpose room at the University of Dayton. Remember if you can’t make the concert although you should – you can catch it on the live stream at wudr.udayton.edu because who loves ya? Yeah we know that was way too much. What can we say? You have excellent taste in music and radio programming! The fantastic Motel Beds are presenting a rare opportunity for Dayton and Miami Valley music fans on January 18th (doors open at 7pm and show starts at 8pm sharp)! In conjunction with We Care Arts and Misra Records, The Motel Beds invite you to join them as they review their musical career with friends, Smug Brothers and Good English at an All Ages show at the Yellow Cab building! The ‘Beds are doing what we call a soft, limited release of “These are the Days Gone By” with 500 LP covers hand-painted by the artists at We Care Arts! A portion of the proceeds from the sale/show are to benefit We Care Arts! “These are the Days Gone By” is a collection of Motel Beds singles, outtakes, and live favorites. Songs have been remastered by Carl Saff (Dinosaur Jr, GBV, etc), with added bass parts by Tod Weidner. This is a soft, pre-release for the first 500 LPs; they’ve all been hand-painted by the artists at We Care Arts (“changing disabilities into possibilities”) you can learn more about WCA at their website – http://www.wecarearts.org/. The album will be released internationally later in 2014 on Misra Records. MOTEL BEDS are a rock & roll band from Dayton, Ohio – a delightfully detached underdog city nestled in the heart of The Heartland. Seasoned veterans, Beds have worked alongside local music advocates Kelley Deal (Deal duets on the lusciously hushed “Tropics of the Sand”) and Robert Pollard (guitarist Derl Robbins has recorded Guided By Voices). Allies aside, when it comes to rock & roll, The Motel Beds speak for themselves. “These Are the Days Gone By” reveals the fruits of Beds’ labor these latter years. The album is an electrifying collection of “hits,” remastered by Carl Saff (GBV, Dinosaur Jr., etc.) and featuring added bass parts by new(est) member and local ace Tod Weidner. Over a 12-song cycle, the proficiency with which Tommy Cooper and P.J. Paslosky (Motel Beds’ core songwriting duo) augment a solid hook is clearly set on display. While “Days” largely finds Ian Kaplan at work as one of the finest rock drummers around today (not an embellishment), Beds demonstrate their versatility with two never-before-released tracks: a poppier version of 2011’s “Sunfried Dreams” and a beautiful acoustic cover of Matthew Sweet’s “I’ve Been Waiting”; the latter proving Paslosky to be much more than a rock vocalist. In addition to recording Motel Beds in a visionary manner, guitarist Derl Robbins adds his own unmistakable style and sound. True to Dayton (see GBV’s “Propeller”), the first 500 LPs are all one-of-a-kind. Each cover was individually hand-painted by the artists at We Care Arts: a non-profit dedicated to “changing disabilities into possibilities.” A portion of the proceeds from these first 500 will go to benefit WCA. In his glowing review of “Dumb Gold” (2012), AllMusic Senior Editor Stephen Thomas Erlewine noted, “[This] is an album that deserves to break them out of the Rust Belt and onto the larger stage; it’s one of the best straight-ahead indie rock records of 2012.” “Days” takes all of “Dumb Gold”‘s assets song writing, hooks, musicianship, energy and ups them ad infinitum. It’s a remarkable rock record and one that finds Motel Beds carrying the torch for Dayton, Ohio’s independent music scene. Misra Records artist Crooks on Tape will be in Dayton on January 30th with Swim Diver, Bearer of Bad News, and Swarm at Rock Star Pro Arena. CROOKS ON TAPE is John Schmersal (Enon, Brainiac), Rick Lee (Enon, Skeleton Key, Butter 08), and Joey Galvan (Mannheim Steamroller, Anthrax). The band was created out of a simple idea of discovery and musical creation – “convene, improvise, and record every moment.” You can listen to their latest record at The A.V. Club website. Swim Diver is an exciting new band featuring members of Brainiac, Captain of Industry, Oh Condor, Me & Mountains, Human Reunion, The Dirty Walk, and Vinyl Dies. This is an opportunity to see some terrific bands! PRESALE TICKETS!